This fabulous property is located in the heart of Country Club Row" and close to everything you need for a perfect desert get away! Just 15 minutes from downtown Palm Springs, El Paseo and the Polo Fields - Palm Desert Resort and Country Club is the perfect place to spend a few months or a few days! Whether you come to escape the winter or enjoy one of our fabulous festivals such as Coachella or Stagecoach, we have everything you want to relax and play under our beautiful desert sun surrounded by breathtaking views of the Santa Rosa, San Jacinto and San Gorgonio Mountains. Resort Amenities: The Resort is a gate-guarded community of 960 privately owned duplex homes, and is only a short 25-minute drive from the Palm Springs International Airport. The homes are single story built in duplex configuration, with a variety of floor plans available for rent. Test your skills on the 18-hole par 72 regulation golf course. The course is a true recreational layout featuring lush double-wide fairways. The spacious 42,000 square-foot, full service clubhouse features a very comfortable lounge and a dining room overlooking a huge lake, and offers a wonderful view of the surrounding mountains. There are 20 heated pools and hot tubs across the resort making every unit just a few steps away from a sparkling blue pool! Did we mention the newly renovated multi-million dollar tournament worthy Tennis complex? Palm Desert Resort and Country Club is just minutes away from everything you need to make your trip to paradise a memorable one. A PREMIER GOLF AND LIFESTYLE CLUB IN PALM DESERT Situated on lush tropical terrain just 10 miles from Palm Springs, Palm Valley Country Club re-defines the private golf club experience. Blending the time-honored traditions of golf with modern, upscale conveniences, the club boasts 36 magnificent holes of golf designed by Ted Robinson, Jr. an array of golf, social and recreational amenities and the personalized service and exclusive privileges that have earned it recognition among the finest private clubs in the Coachella Valley. The masterful course is just part of the experience here at Palm Valley Country Club. Between rounds, you can work on your putt or drive using our practice facilities, visit our Pro Shop for great deals on equipment, and enjoy our bar, lounge, and restaurant. We extend every amenity to our Members, and our dedicated staff is here to cater to the needs of you and your guests. Our upscale conveniences include social and recreational amenities that are simply unmatched. As a Member, youll have access to incredible dining options, a swimming and fitness facility that appeals to the whole family, world-class tennis courts, and so much more. If you live in the Palm Springs area, you owe it to yourself to visit Palm Valley Country Club for a tour of the grounds. We are sure to stand out among fellow golf courses. Youll be impressed by the vistas, landscapes, and privileges we offer Members and guests. With a number of beautifully maintained indoor and outdoor spaces, its easy to see why were a favorite venue for weddings and special events. Whether youre a passionate golfer looking to improve your game or you simply want a place where you and your family can relax and enjoy the weekend, were here to make you feel right at home. Welcome to PGA WEST, the 2,000 acre golf and lifestyle community that is both location and legend. Ideally situated in the beautiful town of La Quinta, California, PGA WEST is located in the preferred destination of the greater Palm Springs area. Surrounded by the sculpted panorama of the Santa Rosa Mountains and home to the game-changing CareerBuilder Challenge golf tournament (formerly the Bob Hope Classic), PGA WEST and its championship courses truly are larger than life. From Hollywoods most high profile celebrities and presidents to numerous PGA TOUR Pros, many have enjoyed our property as the celebrated locale for some of the sports finest moments. Whether its your first trip or youre nearly a native, there is always something new to discover in Palm Desert like tranquil pools tucked amid palm trees, pristine golf courses surrounded by desert views and, of course, endless California sunshine. 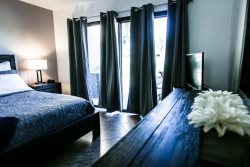 And best of all, its easy to travel to Palm Desert as we are a short drive from all of Southern California and located near several airports promising you a Palm Desert vacation that is as easy to get to as it is relaxing.